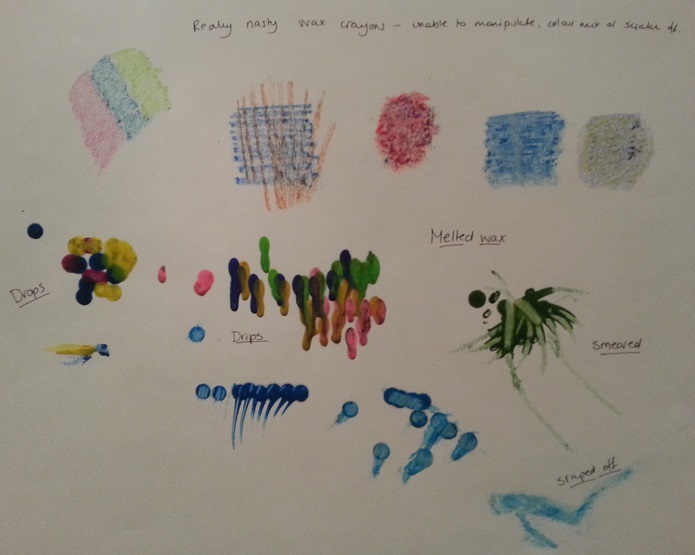 Experiment and play about with all the coloured media you have and find out what they do best. 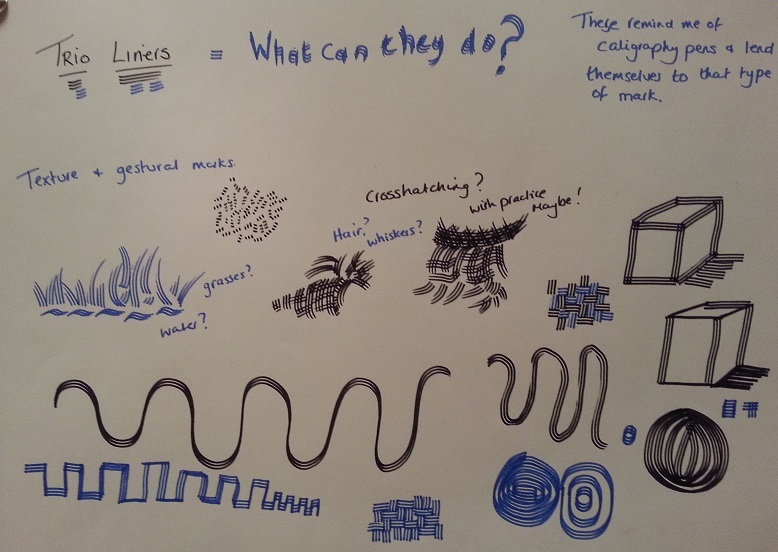 Draw random lines, straight and curved, get the feel of each of the media. Use different hand pressures so that you get bold and faint lines. 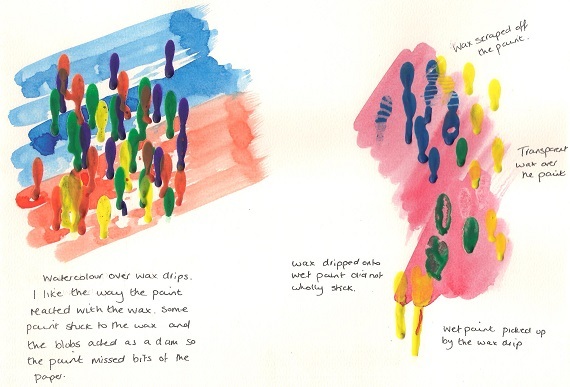 The first media I chose to experiment with was coloured pencils on cartridge paper. These pencils are Derwent Academy pencils and I found them quite difficult to manipulate as they were quite hard and waxy – budget range of the Derwent pencils. 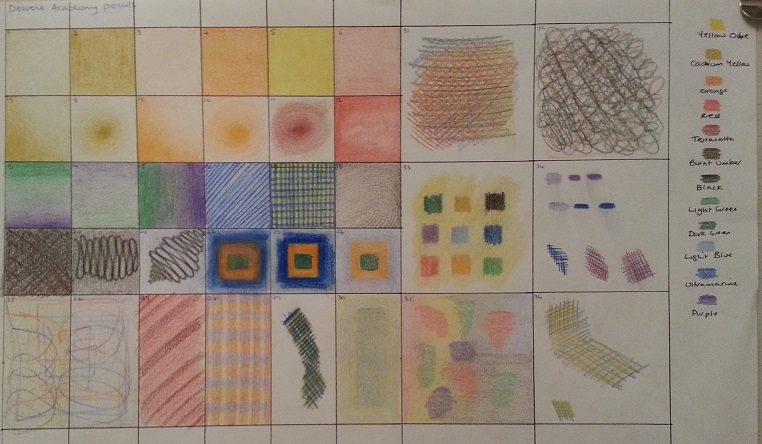 I drew several boxes and tried the same technique in different boxes using different colours to see if handling was different. Overall, I found that I really had to be careful about pressure as it was quite easy to make a heavy mark when I didn’t intend to. Going from light to dark took practice to get an even transition. With these pencils it took a long time to achieve a depth of colour and I kept going over the same area with the same pressure to keep it even. Pressing hard made hash lines which were impossible to get blend out to a soft edge. I was disappointed with these pencils as they didn’t seem to have a richness to them, they were rather pale and waxy. Because they were budget pencils, it took longer to achieve a result. This first page took hours to complete and I got a sore wrist and was disappointed. The second page is Faber Castel Polychromos pencils. I bought a selection rather than buy a pre-chosen range. I tried similar exercises as the first page and found they had a different texture, a bit softer and didn’t have the waxy feel like the Derwent Academy, but it still took a while to build up any depth, but I felt happier with them. The next set I bought were the Derwent Colour soft, on the recommendation of my local art shop. Overall I found that there wasn’t much difference between the Polychromos and the Colour soft but I thought that each different types of pencil woudl lend themselves equally to drawing different subjects. 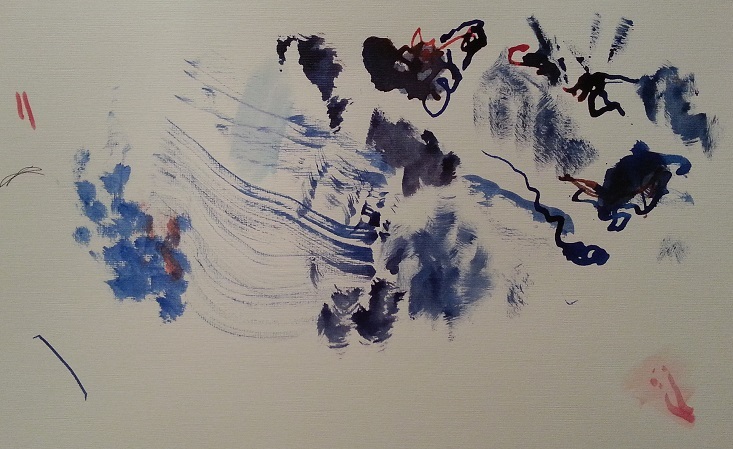 The marks below are ink on acrylic paper using a feather. Using both ends of the feather, I had more control with the feather end that the quill end. The marks are quite haphazard and uncontrolled but I think they will have their uses. 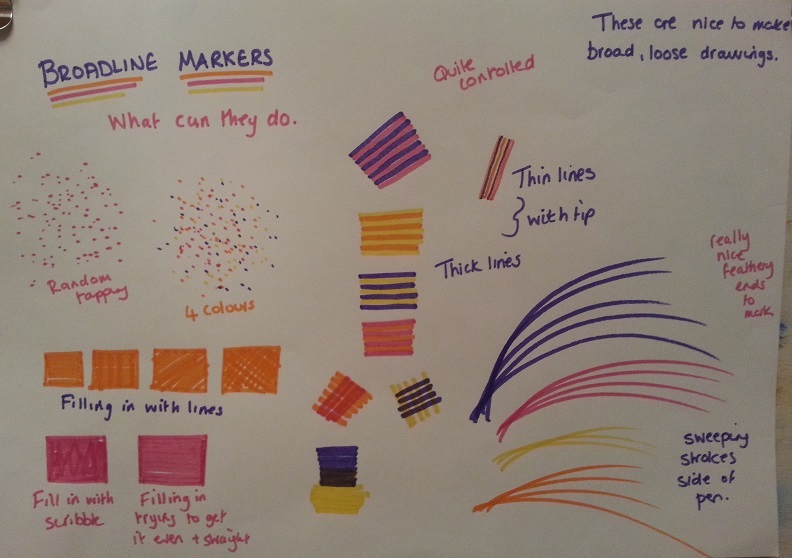 More experimentation is needed to work out how to use these marks to their best advantage. They would be lovely used for the right project. 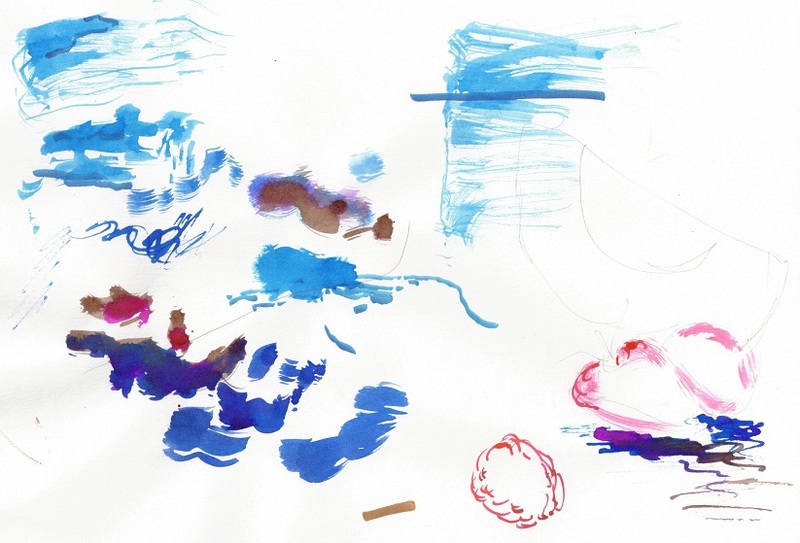 This is ink on cartridge paper using a feather with a couple of other experimental marks with a nib. This is ink on watercolour paper using a paint brush. As I’m not really sure how to use inks yet, I experimented by painting the ink onto the paper with a brush then used a damp or wet brush to push the ink about. The wet into wet mingled colours is a nice effect. The exercise asked for stippling and hatching. I used marker pens to facilitate speed. By working a strip of dots, I tried to achieve optical mixing which I think worked quite well. The hatching was more difficult to achieve as I didn’t cover the whole of the strip and you can see some of the background between the marks. I didn’t vary the length of the hatching, which may have made a difference. I got some cheap wax crayons which were terrible to draw with. 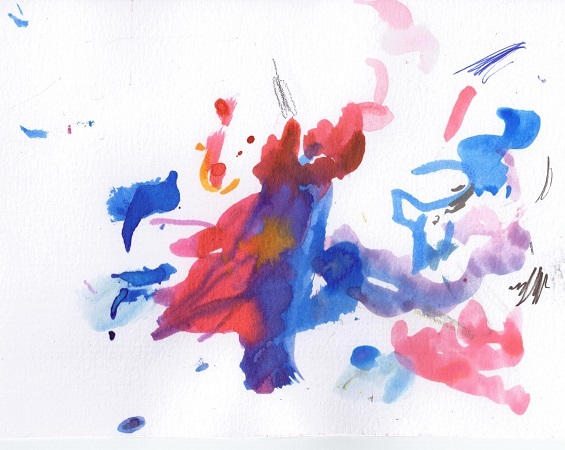 The pigment would not stick to the paper and was quite ‘clumpy’. I tried several combinations of laying down the colour overlaying it, scrapping it off and the effect was horrible. So I tried something different. 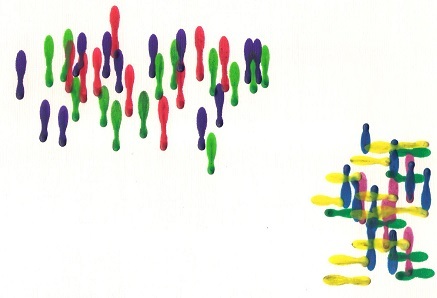 I melted the crayons and dripped them on the paper. They gave a pretty even drip and I quite liked the effect that was created. I overlapped them in different directions and because they were semi opaque, there was a bit of colour mixing. Whilst the wax was still hot, I scraped into it to spread it, smeared it and fanned/feathered it out. These effects could be useful with the right quality of wax. I also used the wax with watercolour, first washing over the wax and then dripping wax onto paper I’d lightly washed over with colour. There were various effects created. I’m not sure how useful this is as some of the ends of the wax drips fell off. It was nice just to play with the wax, and I suppose if ever I want to depict pins in a bowling alley, job done! Since doing this experiment, quite a lot of the drips have fallen off the paper and have left a stain. If I were to use this technique, it would have to be tested for robustness. 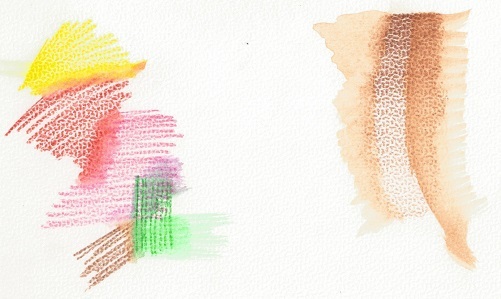 I bought some really cheap water colour paper that had a really distinct tooth/pattern. The marks re made with inktense watercolour pencils that I took a damp brush too. I really liked the effect created and even liked the pattern of the paper. I think this could be useful for certain types of effects, buildings, foliage or animal skins? The brown mark reminds me of a giraffe. Even though this is cheap paper, I really like the effect. These broadline markers were fun to use and the broader more define mark lends themselves to larger more gestural marks. The trio marker overlaid on top of the broadline marker gives an effect that looks out of focus, which I quite like. The trio markers can create a variety effects like basket weave, animal fur, grasses, etc. This exercise is to be continued as there are loads of different media and different paper types to experiment with.